Congratulations to the winners of our 2018 End-of-the-Year Contest! One Grand Prize winner received all 45 of Carol Fitzgerald's Bookreporter.com Bets On picks from 2018, while nine others won a selection of five of these titles. You can see all the winners below, along with 2018's Bets On books. 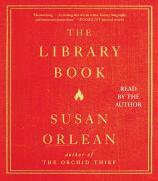 THE LIBRARY BOOK by Susan Orlean is a perfect gift for any booklover, perhaps even a “to me, from me” gift. I have spent a lot of time in libraries, remember the sheer joy of seeing the bookmobile on the corner when I was a child, have a number of librarians and library directors as friends, and have been to library conferences and programs, yet I still found myself learning so much as I listened to the audiobook. It is narrated by Susan, who not only writes a good book, but also knows how to tell a good story.